HomeEntertainmentSmart Music Live believes that Beliebers can’t wait for Justin Bieber Purpose Tour Manila! Smart Music Live believes that Beliebers can’t wait for Justin Bieber Purpose Tour Manila! The tickets for the Justin Bieber Purpose Tour Manila concert on September 30 at the Philippine Arena will be available on July 9, but Smart Music Live make it easy and earlier for the Beliebers who are Smart subscribers because of the exclusive pre-sale. 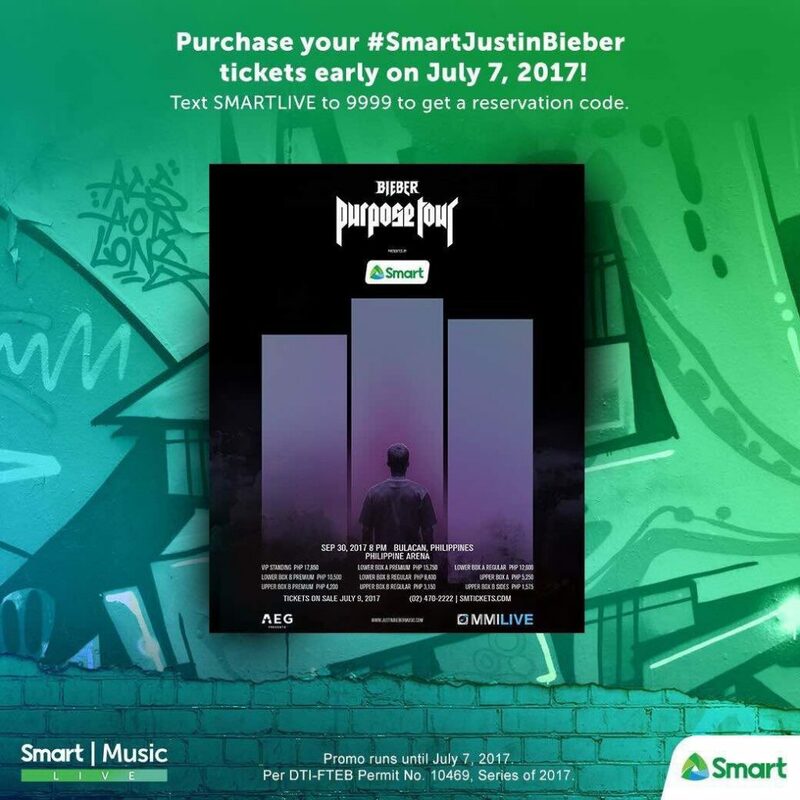 From July 6 to 7 Smart Beliebers who wanted to join the exclusive pre-sale of Smart Music Live for the Justin Bieber Purpose Tour Manila just need to text SMARTLIVE to 9999. The subscriber will receive an 8-digit unique code, which will serve as a reservation code. Only 4, 800 subscribers to redeem their reservations codes immediately can purchase a maximum of 2 tickets at any SM Ticket Outlet nationwide. Just take note that one Smart number will receive one (1) reservation code. After receiving the 8-digit reservation code, go to any SM Ticket Outlet nationwide on July 7, 2017 to purchase your tickets. Each reservation code can purchase a maximum of two (2) tickets within the same section. The code will be applicable to over-the-counter purchases only. Promo runs until July 7, 2017. Per DTI-FTEB Permit No. 10469, Series of 2017.